I had to rub my eyes when I saw this: Apple is opening up the iPhone to third party developers. “Let me just say it: We want native third party applications on the iPhone, and we plan to have an SDK (software developers kit) in developers’ hands in February,” Apple CEO Steve Jobs wrote in a noted (signed “Steve”) on the Hot News page. Really? Huh. Just two weeks ago, Apple announced the opening of an iPhone Web Apps Directory on its site. 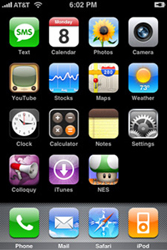 The directory move was seen as Apple reinforcing its commitment to the Web-based apps approach. Those who hoped for third-party applications on the iPhone sighed, shook their collective heads, and wondered why. Why is it taking Apple so long to deliver third-party apps? Jobs explained, “It will take until February to release an SDK because we’re trying to do two things diametrically opposed things at once — provide an advanced and open platform to developers while at the same time protect iPhone users from viruses, malware, privacy attacks, etc. Apple has security and virus concerns. Apple didn’t want the iPhone to detract any more than it has from the development of the new operating system Leopard, which has already been delayed. Plus, third-party developers are working diligently on Leopard applications as well. It was always planned this way (my favorite). Apple wanted to wait for the delivery of the iPod Touch, which is just like the iPhone but without the phone and camera. The forthcoming SDK will also support the Touch. I’d also like to throw in competition. This week Nokia showcased an updated S60 mobileOS, which will support a touch-screen interface. And while it’s not a phone, Nokia’s N810 (announced today), the latest version if its Linux-based tablet, will sport wi-fi connectivity, GPS, Bluetooth, a large, bright display, among other niceties. And, finally, what would speculation be without the conspiracy theory? Some believe that Apple is building an iTunes-based platform to securely deliver apps to users, so that it can profit as the middle person. “From movies to music to software, Apple is plotting a way to keep itself in the middle of any money-making transaction on its hardware,” notes ValleyWag. So, in a way, third-party applications will be the second coming of the iPhone — and I bet there is some new hardware to go along with the applications. Photo credit: image of iPhone with third-party apps from Engadget. If Apple does the middle man situation and tries to make a buck off of EVERY app, I’m still going to hack. Hands down. Maybe the competition from Nokia is starting to get hot? e.g. the new Ovi APIs. I love this phone I have used it for a while now no problems!